Robert III lived from 14 August 1337 to 4 April 1406 and was King of Scotland from 19 April 1390 to 4 April 1406. He was the oldest son of Robert II. The wider picture in Scotland at the time is set out in our Historical Timeline. Robert III brought to the crown a series of disadvantages. The first was that many questioned his legitimacy: such were the doubts about the validity of his parent's marriage that they remarried some time after his birth. The second was that he had an enormously ambitious and totally unscrupulous younger brother, Robert, Duke of Albany, who had been appointed by their father as the preferred Guardian of Scotland in the final years of his reign: and who wanted the crown for himself. At this point the story gets confusing: Robert III had a younger brother called Robert? Yes he did: Robert III was actually christened John, but his third disadvantage was that "King John" was deemed to be too unpopular a name, reminding people too much of the bad old days of John Balliol: so he took the name Robert III instead. This must have displeased his brother Robert still further. And Robert III's final disadvantage was that he had been seriously injured by being kicked by a horse in 1388, and had never recovered from his injuries. It seems unlikely that Robert, Duke of Albany ever really released the reigns of power to his older brother Robert III and for part of his early reign still retained the title Guardian of Scotland. Indeed, the new king received remarkably little support from any of his siblings, with younger brother Alexander, the Wolf of Badenoch, launching an attack on Moray even before Robert III was crowned. By 1398 Robert III's health was restricting him so much that the Scottish Parliament appointed his oldest son, David Stewart, 1st Duke of Rothesay to be Lieutenant of the Kingdom and rule in his father's place: at the same time they made Robert, Earl of Fife the Duke of Albany. David provoked and then failed to prevent an English invasion that got as far as Edinburgh before retiring, and he went on to make a number of decisions that made him increasingly unpopular, especially with his uncle, Robert, Duke of Albany. Albany arranged for David to be arrested and imprisoned in St Andrews Castle, before being moved to Falkland Palace. David died during his captivity at Falkland Palace, aged just 24, in March 1402. 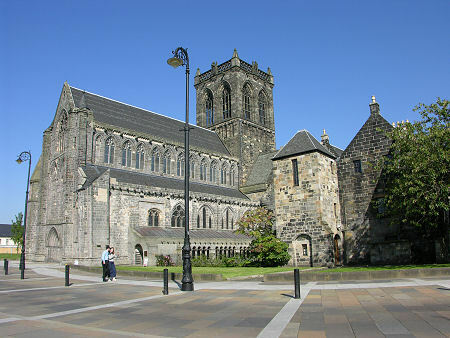 The General council of Scotland, largely under the control of Robert, Duke of Albany, concluded that David had died "by divine providence and not otherwise". The truth seems to be that David was starved to death at the command of his uncle. Robert III, now largely sidelined in his own kingdom, sought to protect his remaining son James Stewart by rallying support for him, making him Earl of Carrick, and making Stewart lands in the south west into a separate principality for him. In early 1406 James' supporters were beaten in battle by forces of Robert, Duke of Albany near Edinburgh. James went into hiding, first at Dirleton Castle in East Lothian, then on Bass Rock. He was eventually rescued by a merchant ship from Danzig. However, this was intercepted by pirates off Flamborough Head and James was captured, before being handed over to Henry IV of England. On hearing the news Robert III died on 4 April 1406. Robert effectively wrote his own epitaph: Let those men who strive in this world for the pleasures of honour have shining monuments. I on the other hand should prefer to be buried at the bottom of a midden, so that my soul may be saved in the day of the lord. Bury me therefore, I beg you, in a midden, and write for my epitaph: Here lies the worst of kings and the most wretched of men in the whole kingdom. He was buried at Paisley Abbey, being unworthy, he said, to be buried at Scone. With James I a captive of the English, the Scottish Parliament appointed Robert III's brother, Robert, Duke of Albany, as Governor and Regent of Scotland. He was to retain the post until his death in 1420.